I wanted to take moment to show you my latest augmented reality target which is an interactive game board called “What’s Your Zone?” After seeing a really cool picture tweeted by Andy Vasliy where he and his students identified various ways different rates zones positively impact the body I was inspired to create this fitness game. Students can play in pairs or larger groups. One student will start by rolling the dice and then scanning the game board target. Once the target is scanned, a 3D brain will appear (left) in the middle of the board and the board game will come to life. The student can then push the game square they land on, which leads them to a specific fitness task. The game squares are split into green, blue and red squares, with each color representing a different heart rate zone. 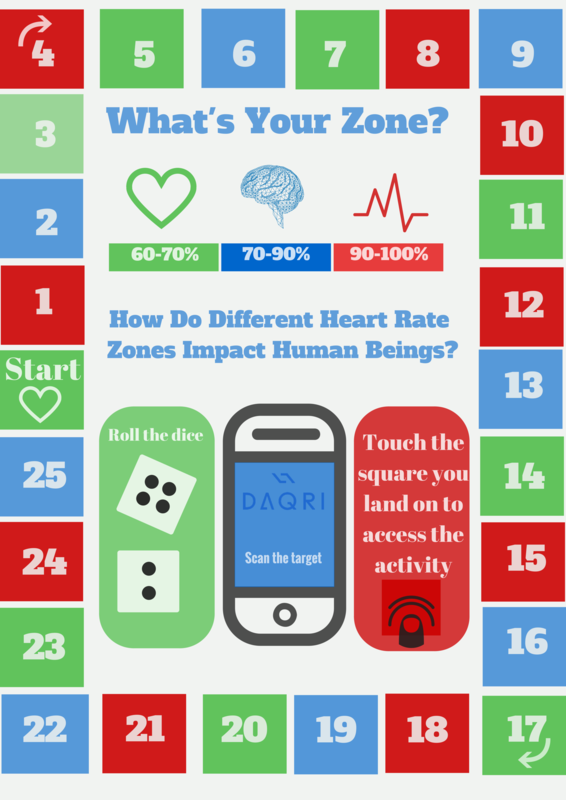 The fitness task for each square is related to the colored heart rate zone of the square. Along with the fitness task is a fact on how the body is impacted by that heart rate zone. Once the student has completed the fitness task, it is the next student’s turn. Students can keep track of where they are on the game board by remembering the number they landed on during their last turn or with game pieces provided by the teacher. 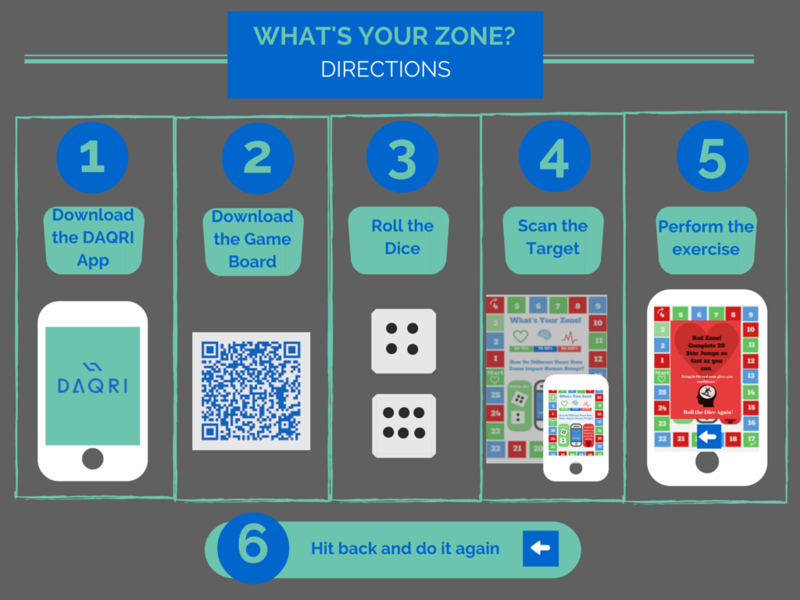 Below are directions on how to use the Daqri App to access the game board. I realize technology is not accessed at every school so I have also made a hard copy of the game that can be found here and doesn’t require a mobile device. You will also find the AR Board Game in the same link. Identify which exercises/physical activities are green zone, blue zone and red zone activities. I use Polar H7 heart rate monitors to accomplish this but students could also take their heart rate manually. Determine and understand the physiological benefits of each heart rate zone. For example, the red zone gives you confidence. Determine and understand the physiological benefits of every heart rate zone. For example, when a student is in the red zone they are growing neural pathways. Increase physical activity outside of school. I will encourage my students to take this game home and play it with their families and friends. Furthermore, teaching how exercise impacts the brain and body, as well as the mental well-being of human beings, is a huge advocacy point for our profession. I hope this can be a tool to help educate the families of my students. Below is a quick video demonstration of what it looks like when you scan the board game target. You are able to zoom in on different areas of the target making it easier to touch the individual squares. I decided not to include any audio or video in my target to ensure that it would scan quickly. This is the first version of this game board and I plan to make revisions to this target as I see how it works for my students. So cool Collin. Thanks for sharing. Colin, you are amazing! Can’t wait to try this out. Keep #playingitforward! Thanks for sharing. Awesome stuff. How can I purchase this game! Jamie, you don’t need to purchase it. The game is free. Access the game by downloading it from the Google doc. (above) and then downloading the DAQRI app for free. Collin! You are a genius! Thank you so much for your ingenuity and your generousity. You made my MONDAY! How do you download the game and use it with the DAQRI app? I downloaded the app and added the game board to google drive. …where do I go from here? 1. Print out the AR Game Board or just simply put it up on your computer screen. 2. Open the DAQRI app. Once it’s ready a white transparent screen will appear. Push the screen with your finger. 3. Once you have gotten rid of the transparent screen you are ready to scan. Hold your mobile device over the target/game board. Make sure the game board is fully in the screen. Hold it there and it will scan and open up the game. Awesome Collin – thanks for sharing! Quite simply – wow! I look forward to seeing how this game, and your future versions of it continue to develop. This has inspired me to download DAQRI app and start learning how I can utilize it as effectively as you have. Thanks for sharing, and raising the bar once again! Wow! This is awesome. Great work. Thanks for sharing. Continuing to push the envelope of creativity in physical education. This is awesome Collin. Will definitely share this with others. Does anyone know how to create something like this!? I would love to create a review game for our Health units. This is fantastic! I can’t wait for my students to use it. I Know how to create it 🙂 Let me know if you need some help. I would love to learn how to make something like this. Can you direct me into doing so? A little Guidance. Nick, take a look at all my blogs I have written of AR in physical education (https://physedagogy.com/category/technology/augmented-reality/). At this time the DAQRI 4D studio is closed but will re-open after they update it sometime soon. When it open up apply and you should hear a response from them soon. Once your in let me know and I would be glad to help you with your first project.